In 2018 the Miami Valley probably used their heating and cooling systems a lot. According to Wunderground, we had 178 days with temperature highs below 60° Fahrenheit, and 108 days with temperature highs over 80° F. That means that for most people they could have their HVAC systems on over 75% of the time. It could be argued that the single, most important part, of any heating and cooling system is the control that operates the system. A low voltage thermostat is the main control for your building that determines how much heating or cooling will be delivered to satisfy the temperature set on the thermostat. Thermostats have advanced a long way in the past 10-20 years as much technology has. The focus for updating thermostats has been on energy savings, cleaner air, comfort, simplicity, quality, accessibility, and easy to understand information among other issues all related to customer satisfaction. Modern thermostats have a lot of features to appeal to everyone, from simple to read displays to utility savings a modern thermostat is an easy upgrade to add to your system to start saving money for years to come. According to First Energy, based on typical energy costs, a smart thermostat can save up to $145 a year. Models rated for Energy Star compliance offer rebates from utility companies as well. Whether a low voltage thermostat is old or new, the way it works is pretty similar even if the parts inside are not. A part of the thermostat is a way to measure the current temperature in the area it is installed, older models had bimetallic strips, while modern models use electronic controls to sense temperature changes. When the strip or thermistor registers a temperature below or above the set temperature it triggers the heating or cooling unit to turn on to maintain the temperature set. Programmable thermostats allow the user to preset temperatures, allowing them to change according to the owner’s programmed settings. Some of those programmed settings examples could be temperature set points at night, work, and vacations. Wi-Fi enabled thermostats allow the owner to check on their system wherever and whenever they like, assuming they have Wi-Fi and/or cellular service. Other features such as maintenance reminders, humidity level display, weather forecasts, energy reporting, zoning compatible, wireless room sensors, smart recovery, AC overcool to dehumidify, service alerts, and more can be found on certain thermostats. Non-Programmable – Non-Programmable thermostats can be mechanical or digital. To adjust the temperature or change from heating to cooling the owner would walk directly to the thermostat to make changes. Programmable – Programmable thermostat come in a variety of programming options, some models makes changes for a week, some for weekdays and weekends, and some models offer more in-depth programmable options including each individual day. Once the thermostat is programmed the idea is that the owner would set up the thermostat according to their own comfort level and the thermostat would adjust on its own as needed, to the schedule you have programmed. Wi-Fi – Wi-Fi thermostats or smart thermostats give the owner the option to not only program the thermostat but to have it adjust to you as well. With features like room sensors, occupancy sensor, and learning technology. These thermostats can adjust to your schedule inside the building. Some models can even change from heating to cooling or vice versa when needed to maintain the set temperature on the thermostat. These models can give even more features to the owner such as enhanced fan control, IAQ integration, weather forecasts, maintenance reminders, smart home/away, and more. A few of these models qualify for utility company rebates. Communicating Controller – Available with variable speed equipment, communicating controllers allow the owner to be the most comfortable. With longer heating and cooling cycles at lower fan speeds, the air is better treated to ensure the best air quality and comfort possible. Other features include energy tracking and reporting, better humidity control, better dehumidification control, and multi-zone compatibility. These models can even alert Hauck Bros. of a major service issue as it happens so we can assist you as quickly as possible. Comfort starts with the thermostat and is backed up by the equipment and Indoor air quality products that maintain your personal comfort level. The thermostat is the control of comfort for your home or business. Depending on the model, the thermostat can save money via programming, provide ease of access with Wi-Fi, send reminders for maintenance alerts, learn to adjust to your comfort level on your schedule, manage humidity levels, and much more. AC Overcool, uses the condensing unit to reduce humidity by cooling your building beyond the desired temperature until the desired humidity level is reached in your home or business. Auto change, also called Auto Mode, Allows the thermostat to switch from Heat to Cool or Cool to Heat automatically. C-Wire, “Common” wire, enables 24 VAC power to the thermostat continuously. Dual Fuel Capable, when a gas furnace and Heat Pump are used in a building. Allows the furnace to take over heating when the heat pump is inefficient. Energy Star Qualified, required to work as a basic thermostat if on-line service is lost, provide information about HVAC energy usage, give residents feedback about energy consequences of changing settings, and provide the owner the ability to schedule or program. By adjusting the temperature down or up by 7-10 degrees from the normal setting owners can save up to 10% on heating and cooling costs. Enhanced Fan Control, with a communicating controller, allows the user to adjust the continuous fan speed to low, medium, high, or off. Thermostat Occupancy Sensor, indoor motion detecting sensor that can detect the presence of a person to automatically control the thermostat to adjust to a temperature preset setting. Outdoor Air temperature Sensor, on select models of thermostats and zoning systems, provides outdoor air temperature information for the control system and the owner as well. Thermostat Password Protection, certain models allow the owner to lockout the control by programming a password to prevent changes. Programmable Thermostat, allows the user to schedule the thermostat to maximize home comfort and save money on utilities. Smart Home / Away, some models of thermostats have an occupancy sensor that detects when someone is home or not. These models have the ability to go into energy saving mode when you are away or to override the energy saving mode to ensure your comfort is met when you are home, regardless of the programming. Smart Recovery, depending on the thermostat, some models have the ability to start cooling or heating your building so that at the time set for a certain temperature set point the temperature will already be at the set point. Smart Speaker Compatible Thermostat, certain models of thermostats have the ability to be connected to your home automation provider. This allows the owner with proper registration to control the thermostat by voice or within that providers app. Staging Settings, with multi speed HVAC equipment, having the proper thermostat to control the which stage the equipment is necessary. This allows the equipment to run in the lower stage or stages before going into higher stages. Touchscreen, with technology improvements in thermostats, most modern digital thermostats come with a touchscreen, similar to that of a smart device. Wi-Fi, A lot of modern thermostats have Wi-Fi capability. Wi-Fi allows the owner to control the thermostat from their smart device or within an app, keep the thermostat updated and secure, and help on energy savings. Using a programmable thermostat in your building will let you run a scheduled heating and cooling program without having to manually adjust the settings throughout the day. Depending on the thermostat setting up a program can be done on the thermostat and if the thermostat is connected to an app or a smart device, it can be done on the computer or smart device. Adjusting the program to lower or allowing the temperature to rise by 7-10 degrees can save up to 10% in utility costs. Make sure to check your thermostat once a year to ensure (depending on the model) that it is level, batteries are replaced (if applicable), and clear of dust and debris. It’s always a good idea to test the heating and cooling equipment before their season to ensure the thermostat is operational and the equipment responds as well. Some models with automatic reminders set up will need the reminders reset ex. change air filter or humidifier pad. 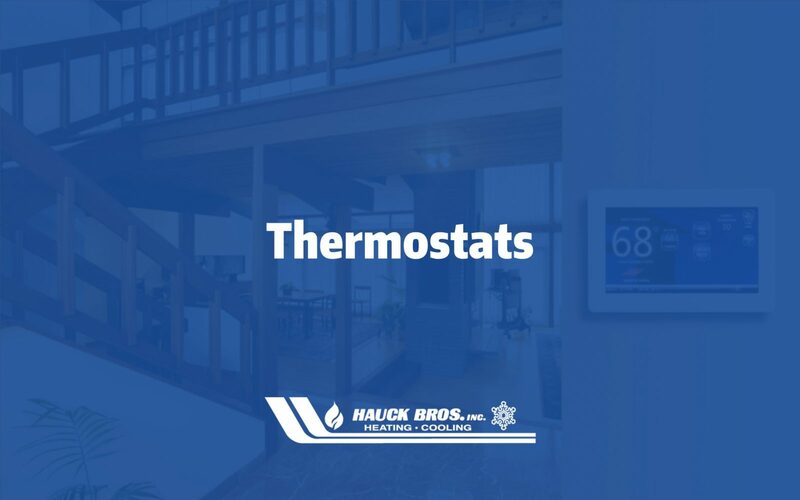 The thermostat should be maintained and checked once a year, if it has no power, doesn’t respond to settings changes, heating or cooling won’t turn on, or loses its programming it might be time to consider a replacement. If your system is being replaced and it was over 15 years old and you would like to take advantage of the energy efficiency of a modern thermostat, replacement should be considered. Even if you have a programmable thermostat but you want the benefits of the features modern thermostats offer, consider replacement. Backplate, in some cases new thermostats are smaller than old thermostats, these backplates are needed to cover the space used by the old thermostat for cosmetic appeal. Thermostat Cover, in some buildings commercial and residential, the thermostat needs to be protected and secured to limit access. A cover goes over the thermostat while providing airflow to the unit to ensure proper temperature control. Room Sensor, some models of thermostats have the ability to have a wired or wireless room sensors connected to it. This allows for the user to adjust temperature based not only on the main thermostat but with input from the sensor as well. The most common options for sensors within the thermostat are to average the two or more temperature readings, use the sensor as the main temperature set point, and to follow the sensor wherever it is moved in the house to maintain the set point.